The 1998 Yankees had a near perfect team. Every player had a role, every player knew his role and every player performed his role perfectly enough to generate a franchise record number of regular season wins (114) and an 11-2 postseason run that culminated in a World Series sweep of a shell-shocked San Diego Padres team. The pitching staff featured a five-man starting rotation of double digit winners led by David Cone who went 20-7. The bullpen was anchored by the amazing Rivera, and he was surrounded by situational workhorses Mike Stanton, Ramiro Mendoza, Jeff Nelson and Graeme Lloyd. I loved watching that team play. To this day, I can easily name 24 of the players who composed that team’s core 25-man roster for the majority of the regular season. The only name I have a tough time recalling is that of relief pitcher Mike Buddie. The native of Berea, Ohio was the 11th member of the Yankee pitching staff that season. He spent most of the season on the parent club’s roster, appearing in 24 games, including two starts and finishing with a very nice 4-1 record but a rather high ERA of 5.62. It was most likely that lofty earned run average and Buddie’s control problems that got the big right hander left off the Yankees’ 1998 postseason roster. But nobody can take away that beautiful championship ring he earned as a significant contributing member of that team. Bidde spent most of the 1999 season back pitching in Columbus, where he put together an impressive 9-2 record. After he started the 2000 season still with the Clippers and lost three of his first four decisions, the Yankees released him. He was able to immediately catch on with the Brewers’ organization. During the next three seasons, his career continued on its yo-yo trajectory between Triple A and the big show. He earned his only two big league saves with Milwaukee in 2001 and earned his first and only victory as a Brewer the following season. 2002 would be his final year in the Majors and he quit playing entirely after one more season in Triple A. He than went to work in the athletic department of his alma mater, Wake Forest University. 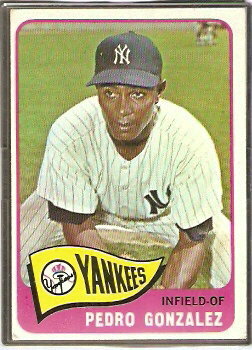 Buddie shares his December 12th birthday with this long-ago Yankee shortstop, this former New York closer, and this one-time Yankee utility infielder. On May 6, 1925, the Yankees were scheduled to play the Philadelphia A’s at the old Yankee Stadium. Manager Miller Huggins picked that particular contest to do something he hadn’t done in the previous 475 regular season Yankee games. That was to start a Yankee player at shortstop who was not named Everett Scott. In fact, up until that afternoon Scott had played in 1,307 consecutive regular season games, which was the all-time record at the time. Huggins felt the streak was putting too much pressure on Scott so he decided to take it upon himself to end the thing. In Scott’s place, Huggins started a 22-year-old rookie shortstop named Paul Wanninger. The kid was only 5’7″ tall and weighed just 150 pounds, which earned him the nickname Pee-Wee. He went 0-2 that afternoon against the A’s and was himself removed for a pinch hitter as he was about to take his third at bat. As it turned out, Huggins’ intention was not to simply give Scott a day off. 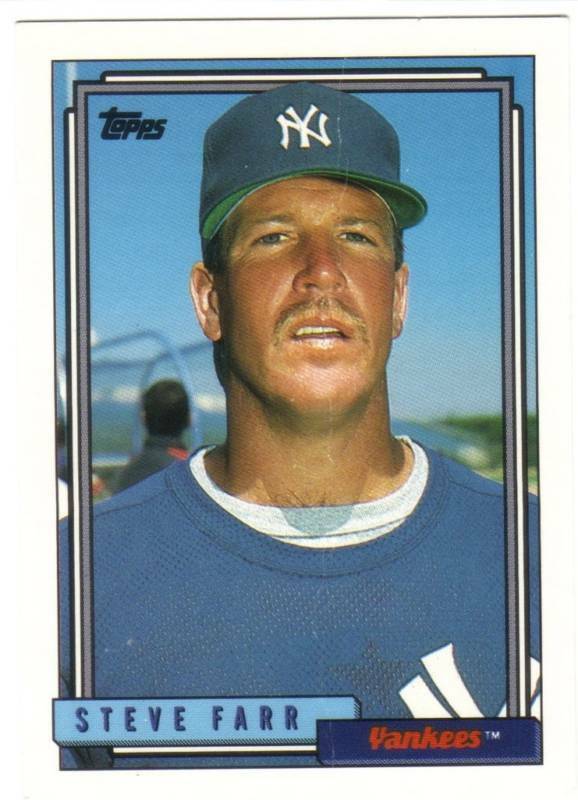 Just a few weeks later, the Yankees placed Scott on waivers and Wanninger took over as the Yankees’ starting shortstop. That 1925 season proved to be a terrible one for New York. It was the year of Babe Ruth’s big bellyache, which in reality was the Bambino’s total physical breakdown caused by his horrible habits and lifestyle. Without their star, New York lost 85 games and fell to seventh place in the AL. Wanninger ended up playing in 117 games that year. Pee Wee got hot early and finished May with a 13-game hitting streak. On June 1, Huggins made another decision that would end up having a legendary impact on the game. The Yankees were losing to the Senators and Wanninger was 0 for 3 and due to come up a fourth time. Instead, Huggins decided to pinch hit for Pee Wee and you know the diminutive shortstop must have been steamed about that decision because it ended any chance he had of extending his thirteen game hitting streak to 14. The guy Huggins selected to pinch-hit was another Yankee rookie, who was built like Adonis and was five inches taller and 50 pounds heavier than Pee Wee. His name was Lou Gehrig. That pinch-hitting appearance would be the first of Gehrig’s 2,130 consecutive game streak, shattering Everett Scott’s previous record and holding up for over 50 years, until Cal Ripken Jr. surpassed it in 1995. In the mean time, Pee Wee Wanninger stayed hot offensively for New York right through June, when he was still averaging .290 and playing a decent shortstop. But as the summer temperatures rose, Wanninger’s bat got cold. After he averaged just .167 for the month of August, Huggins began playing another rookie named Mark Koenig at short. 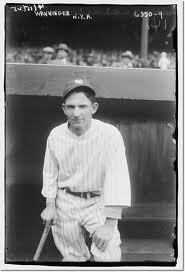 It would be Koenig who would start at that position for the great Yankee teams of 1926, ’27 and ’28. Wanninger would end his one and only year in pinstripes hitting just .236. The Yankees sold him to a minor league team after that season. He got back to the big leagues for a brief spell in 1927, playing for both the Red Sox and Cincinnati and then was gone for good. But not before he got the opportunity to play key roles in the ending of one one of the Game’s great streaks and the beginning of another. Wanninger shares his birthday with this former Yankee closer , this former Yankee utility infielder, and this former Yankee reliever. Today’s pinstripe birthday celebrant was part of an exclusive club. He was the second player in Major League history to play for a team being managed by his father. The year was 1985 and Yogi Berra started that season as Yankee skipper. The previous December, New York had traded outfielder Steve Kemp and shortstop Tim Foli to the Pirates in return for a young power hitting prospect named Jay Buhner, a seldom used pitcher named Alfonso Pulido and Yogi’s youngest son, infielder Dale Berra. Dale had been a good enough player in high school to be selected by the Pirates with the twentieth overall pick in the 1975 Major League Draft. He bounced up and down between the Minor Leagues and Pittsburgh’s big league roster for five seasons before sticking as the parent club’s starting shortstop in 1982. He wasn’t a great hitter, averaging just .238 during his tenure in the Steel City. By 1984 his weak bat and a rumored cocaine habit convinced the Pirates to give up on him. Berra immediately thrived playing for his Dad, hitting in the high .300s during the first two weeks of the 1985 season. Unfortunately, the rest of the Yankees did not follow suit and when the team’s early-season record fell to 6-10, Steinbrenner fired Yogi, replaced him with Billy Martin, who used Bobby Meacham as the team’s shortstop for the rest of that season. 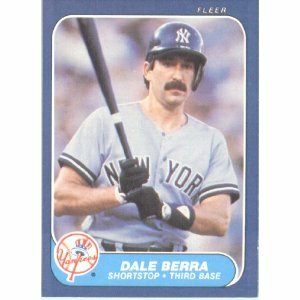 The younger Berra remained in pinstripes until the 1986 All Star break when he became the second member of his family to receive his walking papers from Steinbrenner. In an embarassing prelude to that season, Berra and a bunch of ex Pirates had been suspended for their use of cocaine during the early eighties. His problem with drugs evidently continued because he was also picked up in a 1989 drug raid in his home state of New Jersey and eventually indicted. The first MLB player to play for a club managed by his Dad was Connie Mack’s son Earle, in 1937. Others that followed Berra were Cal and Billy Ripken, Brian McRae and Moises Alou. Another former Yankee born on today’s date led the 1970 Yankees with 29 saves. This former Yankee pitcher and this one-time Yankee third baseman also share Berra’s birthday. The most noteworthy thing about Pedro was that he was one of the first of what would grow into a long and strong list of Major League players to be born in San Pedro de Macoris, Dominican Republic. Gonzalez played just about every positon on a ball field except pitcher or catcher and he was considered a bright prospect in the Yankee farm system in the early sixties. After two-plus decent seasons in Richmond, New York brought him up in 1964 and Yogi Berra used him in eighty games that year, as a backup in both the outfield and infield. He performed impressively enough to make the 1964 World Series roster and actually got a plate appearance in that Fall Classic against St Louis. Early during the following season, Pedro was traded to the Indians for a first baseman named Ray Barker. Gonzalez became Cleveland’s starting second baseman that year but despite a good glove, he did not have enough of a big league bat to keep that position or, as it turned out, to stick in the big leagues. Pedro shares his December 12th birthday with this former Yankee closer, this former Yankee shortstop and this one-time Yankee reliever.